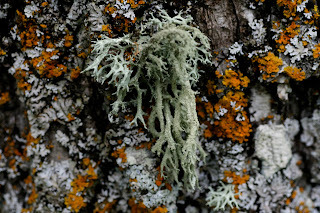 Boreal Oakmoss lichen, Evernia mesomorpha, is an example of a lichen with a fructose, or bushy or shrubby, growth form. It is relatively common at Savannah Portage State Park where these photos are from. It grew on a number of trees at our campsite. 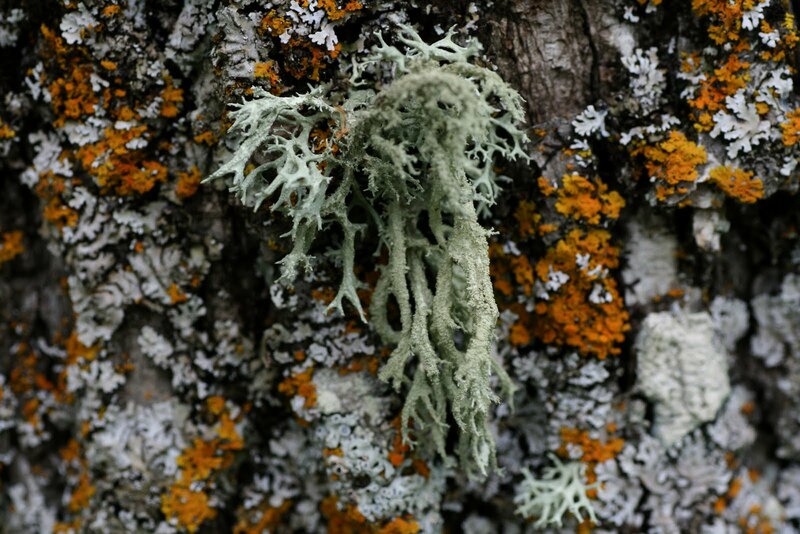 Unlike most lichens, a member of the Oakmoss lichens (Evernia) has economic value. E. prunastri is harvested in parts of Europe and North Africa and is used as a fixative in the perfume industry It allows the scents in the perfume to be released slowly. E. prunastri grows in the United States (mostly in the west), but not abundantly enough to be commercially harvested. It was also a component of "Cyprus powder" with which it was fashionable to sprinkle on ones' hair or wig in the eighteenth century. Many lichens do not do well in polluted environments, but E. mesomorpha is relatively pollution tolerant and can sometimes be found growing near urban centers.